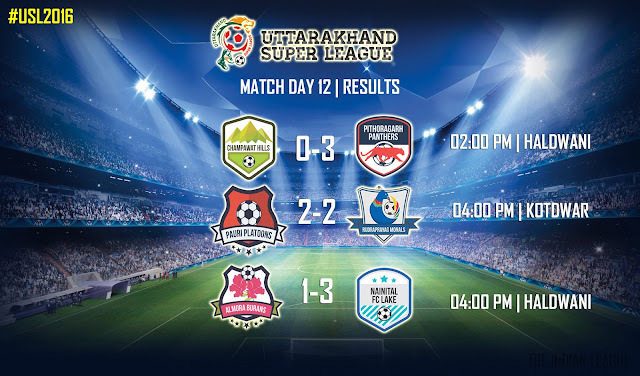 In the first match of the day, Pithoragarh Panthers continued their dominating run in the league as they defeat Champawat Hills with a score line of 3-0. With this win, the Panthers continue to lead the Group B Points Table with 12 points in 5 games, which includes 4 wins and a solitary loss. In the 2nd Mtch, Pauri Platoons hosted Rudraprayag Monals at Kotdwar. The match ended in a draw with both the teams scoring two goals each. The Monals maintain their 4th position in Group A whereas, Platoons leap frog Tehri Lions to go 5th in the points table. The 3rd match of the day and 2nd at Haldwani was played between Almora Burans and Nainital FC Lakes. Nainital defeated the Burans with a score line of 3-1.No. 5 Stephen, No. 17 Nirmal Singh Bisht and No. 11 Sumit scored one goal each for Nainital. Nirmal Bisht was adjudged Man of the Match for his performance. With this win, Nainital FC Lakes and exchange places with Almora Burans in Group B and now occupy 4th position and the latter occupies 5th position.